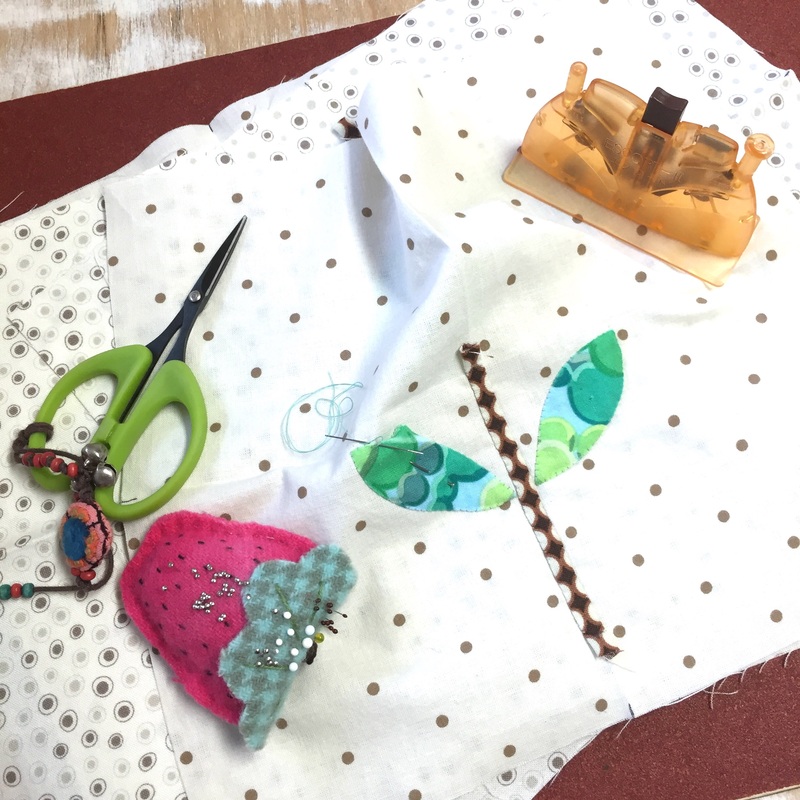 I usually hand applique for 2 to 2 1/2 hours each night in my chair with my feet up and my light in the correct spot (over my left shoulder because I am right-handed). For the last few weeks I’ve added a few hours of applique in the afternoon and I’ve noticed that my neck is sore. Darn it! I know it’s because I’m holding my (heavy) head in the wrong place instead of keeping it centered over my body. I also know that I’ve gotten posture-lazy in the last year. It is really easy to ignore your posture, letting your head drop and shoulders round forward—gravity is working against us. There are, however, easy exercises that we can do to combat this problem. I know because I googled ‘neck and shoulder exercises’ and found this video. As I watched the video, I was reminded that this is exactly what my physical therapist recommended when I was first diagnosed with bone density issues. Doing this for 40 seconds, 6 times a day, is not that hard! However, the warning at the front of the video is true—only do these if your body is up for it. If you are unsure, consult your physician. FYI: I’m not necessarily a fan of chiropractic bending and popping, so please don’t consider this an endorsement of that. PS: If you are like me, you thought it was funny when he said “if you have trouble finding a corner…”. How hard could that be? And then I had trouble finding a corner in my own house :-). This entry was posted in Fitness, Health & Fitness, Quilt Related and tagged fitness, health, posture by Becky Goldsmith. Bookmark the permalink. So nice to see your applique again. I missed it in your posts. I was given the “corner exercise” by my physical therapist (when I had a pinched nerve in my neck) but she told me to use a doorway – works just the same and is easier to find than a corner. I agree—a doorway does work just as well, and they are a lot easier to find! Yep. That goes for beading and posture too. I’ve been going to the physical therapist for an injured shoulder (did it hanging quilts for goodness sake!) and they usually have to spend more time on my neck and back pain, and poor posture. There are many ways to do that “corner stretch”, even at the same physical therapy clinic! I learned a new one today with my forearms and elbows touching the wall. Thanks–this has always been a problem for me. Terrible posture all my life… I will try to remember to do these exercises 6 times a day! I am going to try those exercises, and pass on to my sons too. There’s a link to a video on that page that shows how it works. Sounds like a lot of us would benefit from these exercises. Now to just remember the six times a day. Thanks for the video !!! Thank you! This is very much needed in my sewing circles and guild.